Mobile commerce is growing rapidly fast, Mobile devices play a key role in customer interactions and an increasing number of transactions, including commerce. The rise of mobile has been exponential in recent years and mobile impacts but also continues to drive many evolutions and trends in marketing think about mobile content marketing or mobile email marketing, usability, user experience, the customer experience. 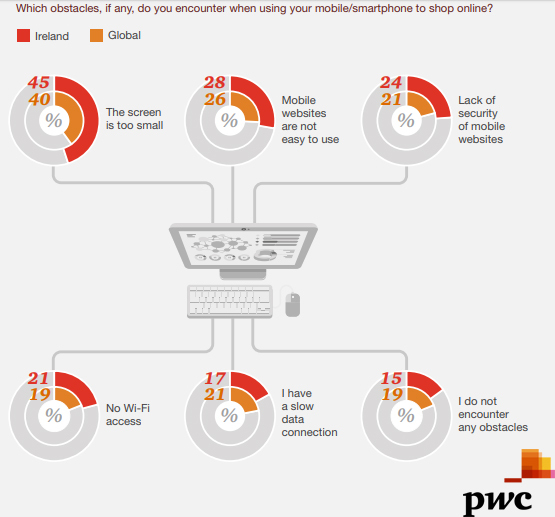 The screen is too small is ranked as the first mobile shopping obstacle at a rate of 45%. Mobile websites are not easy to use is ranked as the second mobile shopping barrier with a rate of 28%. Lack of security of mobile websites comes at next with a rate of 24%. A Graph Shows The Irish Mobile Shopping Barriers, 2017. PwC is one of the leading professional services networks in the world with offices in 158 countries and more than 250,000 people. PwC helps organizations and individuals create the value they’re looking for and achieve the goals they're seeking, by delivering quality in assurance, tax and advisory services.At the end of 2018, PwC firms provided services to more than 429 of the Global Fortune 500 companies besides more than 100,000 entrepreneurial and private businesses achieving gross revenue by US$41.3 billion, up 7% on the previous year.